For countless Christians around the world, “Come, Thou Long-Expected Jesus” signals the beginning of Advent. It was first published in 1744 in Charles Wesley’s Hymns for the Nativity of Our Lord, a little collection so popular that it was reprinted 20 times during Wesley’s lifetime. Published in two eight-line stanzas, this hymn is now generally sung in the Advent season rather than during the nativity of Christ as the title of the collection indicates. 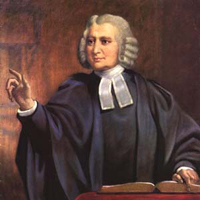 The Wesleys published several small collections of hymn texts that were affordable for a wider number of people. They were usually on themes associated with a particular season of the Christian year or the sacraments. These volumes offered a way to disseminate Methodist theology and enhance the personal devotional life of those in the Society. The collections also provided a corpus of songs to sing together when the Society gathered. Interestingly enough, “Come, Thou Long-Expected Jesus” appeared in an American Methodist hymnal in 1847, nearly 30 years before it was included in a British Methodist hymnal. Only the rare North American hymnal omits this hymn now. It is part of the fabric of our preparations for the Incarnation. “Come, Thou Long-Expected Jesus” has the quality of a petition—a prayer that implores Christ to be among us. Imperative verbs are used six times in the two stanzas found in the hymnal: “Come, thou long-expected Jesus”; “From our fears and sins release us”; “Let us find our rest in thee”; “Now thy gracious kingdom bring”; “Rule in all our hearts alone”; “Raise us to thy glorious throne.” The cumulative effect of these petitions is a tone of supplication. Wesley succeeds in recalling the deep longing of ancient Israel for the Messiah—the Promised One. While many hymns of the Advent and Christmas season recount parts of the narrative of the Christmas story, Charles Wesley offers us a poetic theological discourse that allows us to apply the story of Christmas to our lives. Perhaps the greatest example of this is to be found in Wesley’s famous Christmas hymn “Hark! The Herald Angels Sing”—a hymn that moves theologically well beyond recounting the story of Christ’s birth to an exploration of its meaning. Although we live in a different time than Charles Wesley, the longings of people’s hearts are just as deep. We long for security, love, relationships, meaning. To those who open themselves up to its message, this hymn identifies with that longing at the deepest levels of our existence. Where there is no longing, there can be little meaning. Hope is central to Christian experience. Dr. Hawn is professor of sacred music at Perkins School of Theology, SMU.